I have a goal I visualize every year in December. I want to illustrate the White House Christmas card. My dream took root when I received a Christmas card from the Clinton’s in 1994. They began sending them to me after I created a portrait of their daughter, Chelsea. The card painted by Thomas McKnight, grabbed hold of me and I thought, “I want to do that.” Since that time, during each presidency, I’ve submitted card concepts to the Office of the First Lady for consideration. All the rejections I’ve received have been gracious and none have deterred me. Tell me why, oh why, oh why can’t my dream come true? The full color rendering above is my favorite holiday card concept. It’s entitled, “Christmas in the Blue Room.” That’s were the official White House Christmas tree is displayed each year. 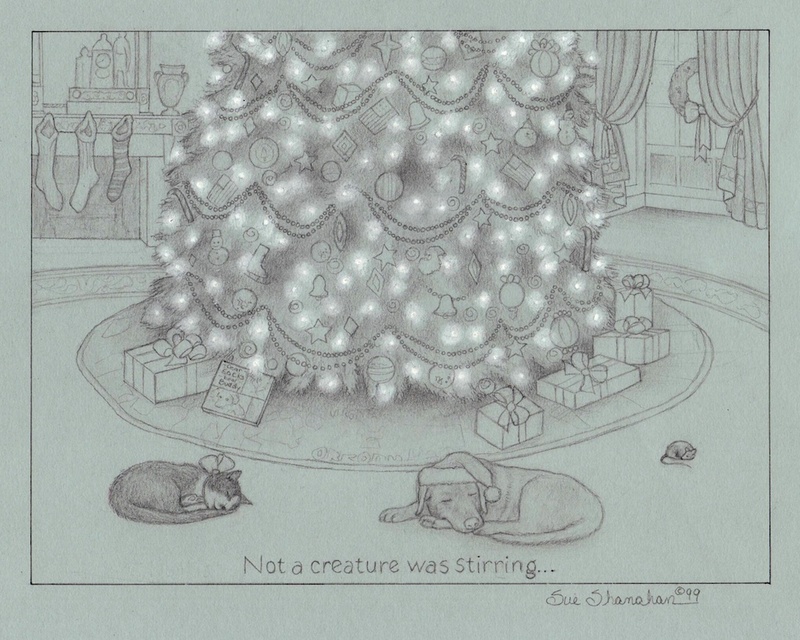 I drew it when President Bush was in office.I couldn’t resist incorporating the Bushes’ dogs Spotty, Barney, and their cat, India, in my illustration. I love the idea behind this piece. 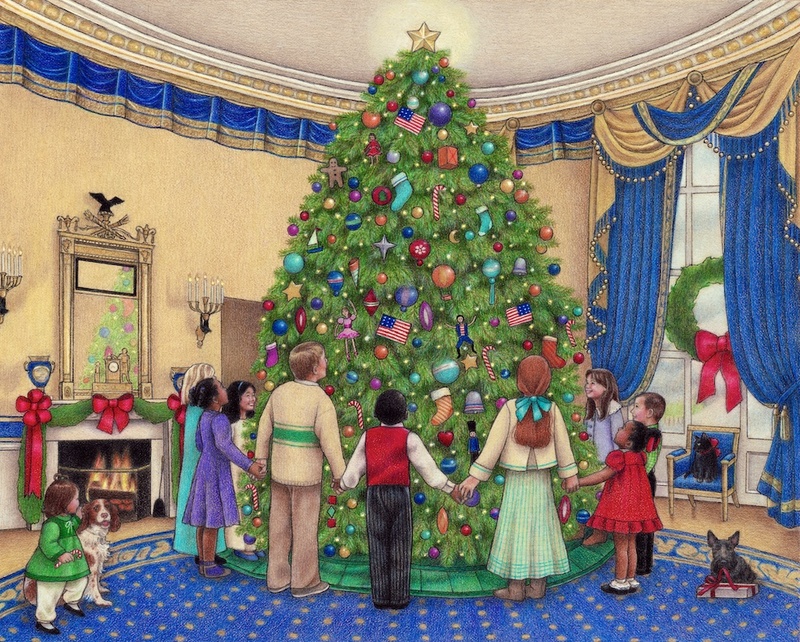 America’s children gathered around the official tree speaks of the melting pot of souls that makes our land great. That they are hand in hand signifies unity. We are all one in this country. Children are born knowing that but it often fades when they begin to model themselves after the adults in their lives. My art shows the beauty in the contrast of our citizens. It speaks of the innate love for each other that we’re born with. As adults, how do we cross the boundaries of fear and intolerance to join together in peace and friendship? The quickest way to get there is through the eyes of a child. A sketch I did during the Clinton Administration. Family pets Buddy and Socks snooze under the official tree. Sue, I have confidence that one day you WILL illustrate the White House Christmas card. And I’m betting it’s not too far off in the future. Keep chasing your dreams. You already impact the world in a beautiful way. Your art and writing are an inspiration, Sue. Thank you for sharing your many gifts and keep pursuing that dream!! Peace, Health amd Love to you and your wonderful family. Thank you, Alice. Sending my love to you and the rest of the Forrest family. Merry Christmas. I agree with Susan, Sue – it will happen for you. What a lovely wish and an inspiring story.